How very remarkable and fascinating every creature of God is. 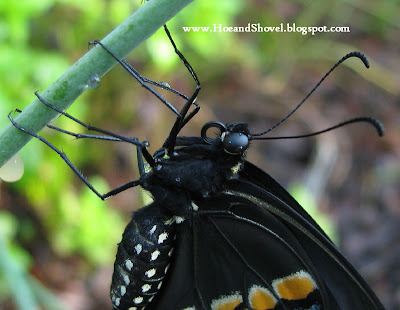 But the life cycle of a butterfly is extraordinarily unique. 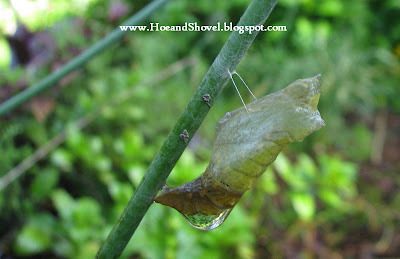 The Chrysalis wasn't one I had seen before today. Even though I had been looking quite diligently in recent days for any sign of Swallowtail pupas hanging around. They are wonderfully camouflaged in their brown or green silk attire. There were two others close by I was keeping an eye on daily. 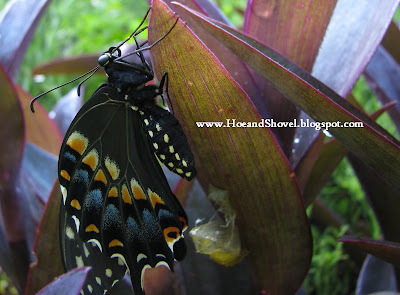 I had high hopes the timing would be in my favor when a butterfly emerged from either one. Those are empty today, too. I missed them all together. On my way around to the back yard I pass by the vegetable garden in the side yard. The butterfly hanging near the edge of the pathway, utterly motionless, caught my attention early this morning. 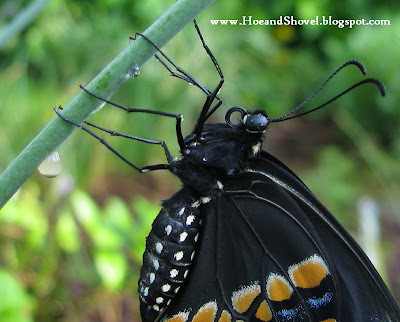 Never before have I witnessed a brand new butterfly just emerged and completely stationary. 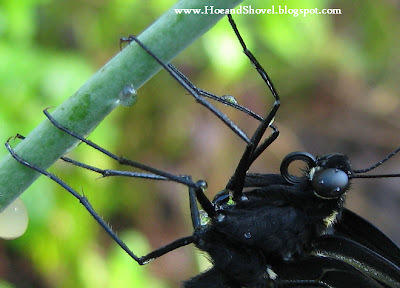 Its wings uncrumpled and folded it hung in its resting mode readying for flight. The sight of it immobile and gently latched onto a stem of Society Garlic bloom along with the open Chrysalis below was the confirming evidence I had stumbled upon a purely fresh new being. Brand new. Perfect in form and color. Its entire adult life still ahead of it. No tatters, no tears, no scars. Pure innocence... just minutes away from taking flight into a brand new world. I observed it closely for long moments in awe of its instincts and wondered if it was one I had handled when it was still a caterpillar. There were several I had moved over to the carrots to provide them with more food when the parsley became scarce. I was tempted to see if it would crawl onto my finger but thought it best not to disturb the natural process. It occurred to me to have a look around the area again. Surely there was a chance I had missed more pupas. After all there had been so many last stage caterpillars only days before voraciously feeding on the carrot tops in this same planting bed. Lo and behold. Just around the corner of the first one hung another one. Its open chrysalis on the underside of a Purple Queen leaf. I'd guess this one is a female. Her upper wing a little paler and seemingly its body a little smaller overall. For the next thirty minutes I kept an eye on them as I went about my gardening. Then, I actually got to see the first one spread its wings and fly away. This one stayed in the hanging postion for longer. I missed its maiden voyage. Very Cool! And your photos are amazing. Wow Meems, How cool is that? I'm amazed at your good fortune. Of course having a favorable habitat as you've so beautifully crafted certainly helps. Thank you for sharing. Lots of visitors in your garden, I like your blue flowers, it's so beautiful, I need to add those in my garden. Great captures. Our daughter raised butterflies one year, it is truly amazing to witness. Meems, You are so inspiring! Every picture worth a thousand words and your words are inspiring too. Thank you. How lucky!!! We missed our's flying out into the world.But we have another generation coming along.Hopefully,this time we'll be as lucky as you. Some of the treasures of the garden beautifully photographed. Oh Meems, I was transported to Florida by your story! So well told and utterly magical in every way with the photos to illustrate it just beautiful. Ahhh. Life is a miracle. Thank you all for your generous and thoughtful comments. I really appreciate every one of you and treasure your words. The vegetable garden has afforded many happy times especially this year since cultivating more of a companion planting, larger garden. It is such a wonderful learning experience. 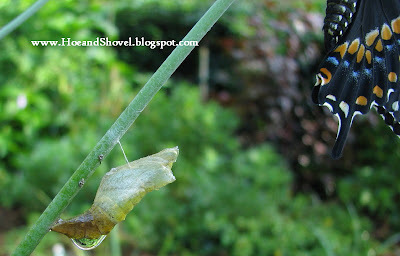 The butterfuly life cycle has morphed before my very eyes. Involving my grandchildren in the learning process has added to my joy. Our youngest grand-kiddo is at my feet this morning playing with his race cars while I blog. We are heading outside this minute to check on all the critters and get out some of that stored-up toddler-energy. He is all geared up for some baseball with his Papa and then his swimming lesson where we will cool off from this interminable humidity. I hope you all get outdoors some today and take in all the amazing critters of summer. Dear Meems.....tku for sharing the beautiful and rare moments in the life of a butterfly. Meems that metamorphosis never stops to amaze me. It reminds me how fragile and precious life is and how we take many things for granted. These moments are priceless and can never be bought. How truly beautiful! That must've been such a soul-stirring moment. 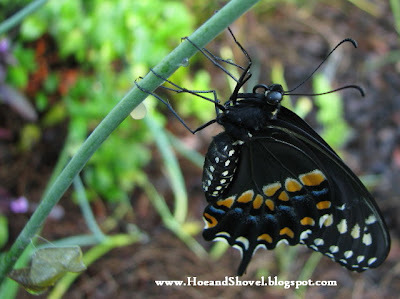 You're very lucky to have such gorgeous butterflies in your garden. And to actually witness this moment... priceless! Meems -- beautiful photos! What a wonderful experience to watch. The butterflies are just starting to show up here and I'm so ready for them. How awesome to see! 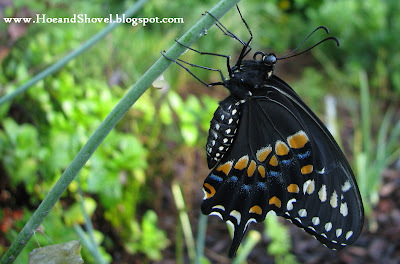 I've never seen a newly emerged butterfly before, other than ones we've had in a butterfly habitat. The pictures are amazing! Thank you for sharing these wonderful montage of the butterfly cycle. I do have a question though regarding posts made in the past....what on earth happened to those peacocks? Were you and your neighbors successful in trapping them? Have a wonderful day with that little grandkiddy! They are so beautiful when they first come out of the chyrsalis. Great photos of the wonderful butterflies. Awesome! What a blessing it was for you to witness these events in the lives of the butterflies! Thank you for sharing the lovely photos with us!